There’s a tree by a river. 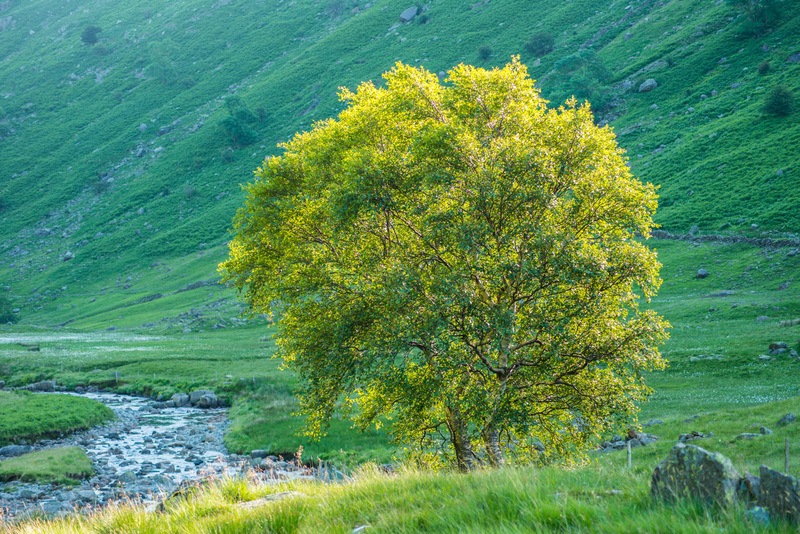 It has come to be my favourite tree – and possibly it’s one of my favourite rivers too. This tree isn’t special because it is the oldest, or the widest, or the tallest. It has strong appeal for me because it holds its place with grace and strength. A birch, it shines and sings. In the summer its leaves become luminescent after rain; in winter it shivers its branches thin as lace against brooding skies. This bronze and silver skinned tree curves out of rock with the sensuality of a woman dancing, arcing skyward. Beneath it the river blues itself by mixing the colour of sky and rock with the white of constant falling. 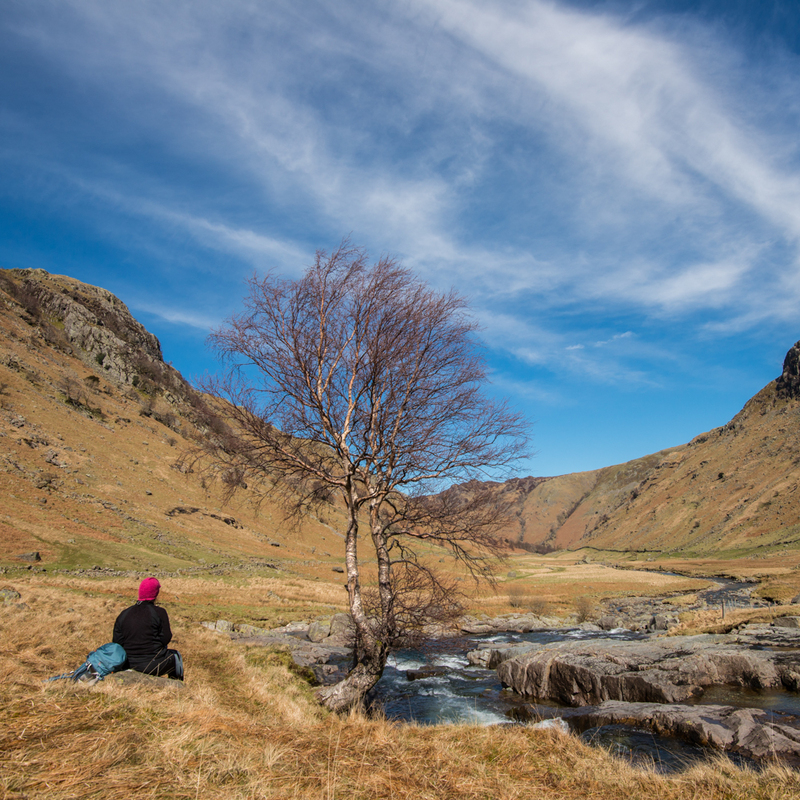 The Langstrath Birch stopped Rob and me in our tracks when we were heading out for a long walk, with the intention of heading many miles up valley. We had only been walking for an hour when we spotted it. When we realised we had been sitting with the tree and wandering around the flat whaleback rocks in and around the river for almost two hours, we laughed. We had been invited in, seduced even, by a stunning tree and the mesmerizing flow of water that is its constant companion. Our meeting with this tree became instrumental in the setting up of The Long View. We had been pondering a project about trees for many months. Long before we met in 2009, each of us had visited and revisited one single sycamore; we had both climbed it and sat in it. Since meeting, we had walked many miles in many valleys and always shared our wonder at the trees we passed. We decided, after meeting this Birch, that we would set out to choose seven trees that drew us in. The rest is history, or at least it is unfolding history, as we walk to each one of the seven trees again and again, encountering both land and trees in all seasons and all weathers. The notes I have been making and the photographs Rob has been taking for more than half a year are born from our intimate observations of each tree; and it’s quite interesting to us that our work is also beginning to reveal a developing relationship with each of the trees. The Langstrath Birch is, as I have said, my favourite, but it’s not Rob’s. His favourite will feature in a future blog. Here’s one of the poems I have written while visiting the Langstrath Birch. This poem is on show as part of a small exhibition of some of our work to date, at the beautifully located Thorney How in Grasmere as part of C-Art. You can visit to view the work until September 24th – turn up between 11am and 4pm (closed Sunday 18th). If you’d like to read more poems, head to the poems page here.